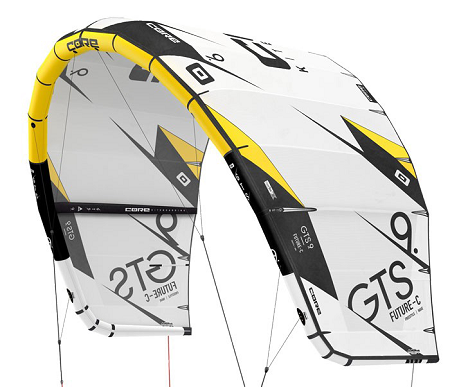 The new GTS3 is THE all in one kite! The brand new three strut construction of the GTS3 is revolutionary rather than evolutionary. Nevertheless GTS fans will instantly feel right at home. They will however be amazed at the playful precision, the noticeable improvement in unhooked characteristics, plus the incredible lift and hang-time. We’ll show you how all of this was fitted into one kite on this page. Three Strut Frame Two less struts results in two additional advantages: Firstly, the GTS3 now turns faster and more directly – new levels of performance have been achieved especially with kiteloops and while wave riding. Secondly, it’s noticeably lighter and more perfectly balanced. Whenever the lines lose tension the GTS3 holds true in position. Future-C Shape C-Kite-Feeling at its best. Even though the GTS3 turns incredibly fast and direct, the kite still remains easily controllable in each turn. This is thanks to the proven Future-C, which has been cut even deeper with the GTS3, resulting in a precise and predictable turning radius. Reactive Tips The tips of the GTS3 are pure precision. Thanks to a noticeably thinner, specifically defined flight profile and a newly designed trailing edge they are optimized to the agility of the 3 Strut Construction. A further reason why turning impulses are instantly translated without hesitation. CoreTex Construction The fabric exclusively developed for CORE is protected and strengthened with three different coating processes. In this way CoreTex® sets new records in load tests, tear resistance, longevity and UV protection. This is noticeable during your session thanks to the crispness experienced whilst flying your kite and another reason why CoreTex® was obvious choice for the GTS3. Short Bridal System Short Process. The super short bridle system is another deciding factor allowing the GTS3 to transform rider input quickly and directly. The bridle geometry has once again been revised and with this the GTS3 has become, more than ever, a wave and kiteloop machine. HF Dacron Sophisticated mix of materials. The kite fabric and tips of the GTS3 have been precision finished, to a defined percentage, with our new HF-Dacron. HF stands for Hard Finish, a harder, coated Dacron variation that stiffens the kite skeleton in the steering relevant areas. In addition it optimizes the energy distribution of the steering input into the kite fabric. CIT Core Intelligent Trip System Thanks to the CIT there is no riding style or level that the GTS3 cannot be customized to. You can adjust the kite bar feedback on the outer bridle lines. The turning speed of the GTS3 can be adjusted at the kite tips. This trimming is easy and intuitive; you simply move a little knot. Second Gen Speed Valve Take a deep breath in, then out. The GTS3 valve will accept all standard pump hoses without attachments. This provides the SPEED VALVE 2 with the biggest, physically possible, flow of air. It’s simply not possible to pump up a kite with less effort and in less time. Even deflating the kite is noticeably quicker and easier too. Grintex Front Tubes Abrasion resistant front tube. Thanks to the new, extreme abrasion resistant patches on all the seam segments of the front tube and the struts you can worry even less about the ground under your GTS3. Speed Pump System Start even faster. The distribution hoses of the One Pump System have larger diameters. The entry points to the struts have also been more aerodynamically distributed, making the air distribution system work more effectively and more comfortably, resulting in stunning inflation and deflation times. Six Year Parts Guarantee Ready for a long kite life. The GTS3 is especially robust and has been built with longevity in mind. All of its components will be available, worldwide, for at least the next six years from date of purchase. This is more than just a promise: with CORE this is guaranteed. Sensor Bar System The GTS3 is perfectly matched with our brand new bar systems, the SENSOR 2 bar and the SENSOR PRO bar. They offer superior safety of the SUPPORTED SINGLE FRONTLINE SAFETY (SSF): The kite will be released, without pressure, on a single front line and with partial release on the other frontline resulting in the kite being automatically positioned in the optimum defined position for a re-start. Naturally, the GTS3 is also 100% compatible with all the older CORE bars. Instant Auto Relaunch If you happen to have a mishap on the water, don't worry. The new GTS3 will be flying again in, well, "an instant"; thanks to it's optimized geometry. If you happen to eject, the SUPPORTED SINGLE FRONTLINE SAFETY will disarm your kite without hesitation, and will be waiting for you in the re-launch position. This makes it an ideal match for anyone; whether you're just doing your first water starts, working on your "Triple-Lindy", or getting barreled in Indonesia - you'll be up and riding again before you can say "CORE Kites Rock".